The Urban Development Authority's 'Macon Action Plan' is aiming to improve the future of downtown Macon. 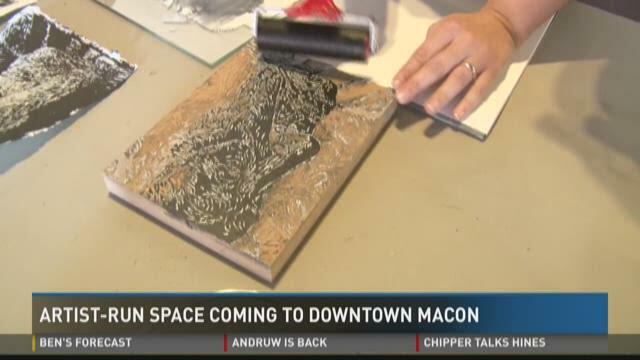 Their website says more than 100 empty store fronts are in the urban core, but one Macon couple is trying to bring more activity in to downtown by opening an artist run space in a 5,000 square foot warehouse. It's called Ampersand Arts and Claire Davis met with one artist who says the art center is needed. Art is deeply embedded in Deonna Belcher's roots. "I came into art as a water colorist, but I have just a lot of interest and I see things in my head that I just want to get out," she said. "When my mom was ill, I started painted again so she could see it, and it just morphed and that's been about 10 years ago," said Belcher. She dabbles in everything from painting to drawing but her specialty is recycled goods. "Everything here has either been bought for dirt, except for tools of course been donated to me, or I have recycled," said Belcher. She has an art space at her home, but says distractions like chores and work keep her mind blocked from creative thinking. Becca and Gabriel Balmes are trying to open a space for people like Belcher to put their talented to skills to use. "We wanna have an artist-run space was the idea behind this. Where it's going to be a space that's put together for the artists that our efforts are going to be in trying to support them as best we can, provide the resources that we can, encourage them, try to facilitate the collaboration," said Gabriel Balmes. The couple is leasing a 5,000 square foot storage warehouse at Fifth Street and Poplar in downtown Macon. "We're in a space that's comfortable where you know that you can art anytime. All the time and it's going to be appreciated by the people around you," said Balmes. Belcher says the space is needed in the urban core. "I can come in and really just focus on what I'm doing and not have anything else to interrupt me and I'm thrilled about that," said Belcher. Balmes says the space will be free and open to the public, but if you're interested in becoming a member to have access to things like their computer lab and other tools, you'll pay a fee of $12 a month. That money will go toward keeping the place up and running. He says he hopes to have a grand opening the end of May. For more information on Ampersand Arts you can visit their website.